With ATV [i]Johannes Kepler[/i] in space and ATV [i]Edoardo Amaldi[/i] almost built, the next Space Station supply craft coming off the production line has been named after the most famous scientist of all time: Albert Einstein. Launch is expected in early 2013. With relativity and E=mc2, Albert Einstein is a major icon of 20th century science. His theories have been stringently tested in space and his work is used to guide spacecraft to other planets - and now he will fly into orbit. ESA has decided to name the fourth Automated Transfer Vehicle (ATV) after Albert Einstein. ATVs are an essential contribution by Europe for supplying and maintaining the International Space Station. The vessels are named after great European scientists and visionaries to highlight Europe's deep roots in science, technology and culture. Naming ATV-4 after Albert Einstein, as proposed by the Swiss delegation to ESA, reflects this approach. Einstein's contributions to humanity and, in particular, science overturned our perception of the Universe. ATV is also strongly linked to Switzerland: its structure is built by Swiss industry. [b]World citizen with roots in Switzerland[/b] Albert Einstein was born in 1879 in Ulm, in Germany, but studied and spent his early career in Switzerland. His job at the patent office in Bern gave him time to develop his revolutionary ideas. His [i]annus mirabilis[/i] of 1905 - year of wonder - saw him publish four fundamental scientific papers on the photoelectric effect, Brownian motion, special relativity and the equivalence of matter and energy. In 1908 he moved to an academic career in Bern and went on to Zurich, Prague, Berlin and, finally, after emigration to the USA before World War II, Princeton University. He was awarded the Nobel Prize for Physics in 1921. He died in the USA in 1955 at the age of 76. [b]Next two ATVs on production line[/b] After launching ATV [i]Johannes Kepler[/i] to the Space Station this February, ESA plans to maintain a steady cadence of one vessel per year. The next, [i]Edoardo Amaldi[/i], is already assembled and is being tested in Bremen, Germany. 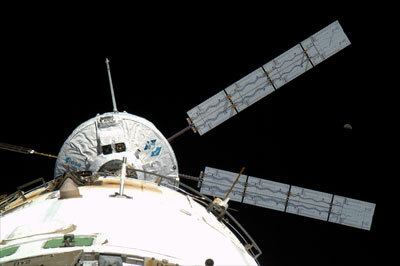 ATV-3 will be shipped to Europe's Spaceport in Kourou, French Guiana, in August for dispatch to the Station in February 2012. 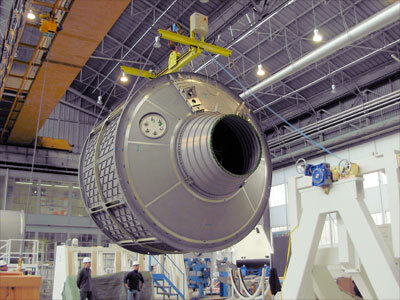 The three main parts of ATV-4 are being built. The Integrated Cargo Carrier, designed to carry water, gas, refuelling propellants and dry cargo, is in Turin, Italy, and will be shipped in December to Bremen. The Equipped Propulsion Bay, housing the engines and propellant tanks, is built in Bremen. The Equipped Avionics Bay - ATV's 'brain' - will be mated at end of the year with the propulsion section. The plan is to launch [i]Albert Einstein[/i] to the Station at the beginning of 2013.